Let’s appreciate that mediators know a lot about multi-tasking. In role of mediator, you are simultaneously listening, identifying what type of a comment has been made (position, interest, possibility etc), choosing a response (from a wide range of possible communication interventions), formulating a next question, managing time, reading body language, sensing emotion, and assessing progress…phew! That’s a lot going on…and then throw note taking into the mix. It’s potential to overwhelm us might be part of why so many mediators keep their notes private during mediation. One of the most important parts of becoming a Visual Mediator (a mediator who maps the notes publicly so parties can see and work with their information) is learning how to simultaneously listen to a conversation and synthesize the information while also writing and drawing on the map. Sure, it’s a talent that needs to be honed and practiced, but once you get it down, it’s an invaluable combination of skills that improves communication and helps parties come to a clearer understanding of their situation so they have a better shot at arriving at a resolution. Here’s a few things to know about how the “juggling act” of visual mediation happens. What you need to first understand is that you’re not a stenographer; it’s not your job to track and record every detail of the meeting. The idea is to go for the nuggets and get down concise, relevant points that provide a condensed overview of the discussion. Your job is to summarize and integrate the most beneficial parts of any exchange and present it back in a way that facilitates greater understanding, assists communication, and helps organize the information being generated. This is precisely the opportunity mediators miss when they take notes that only they can see during the mediation. 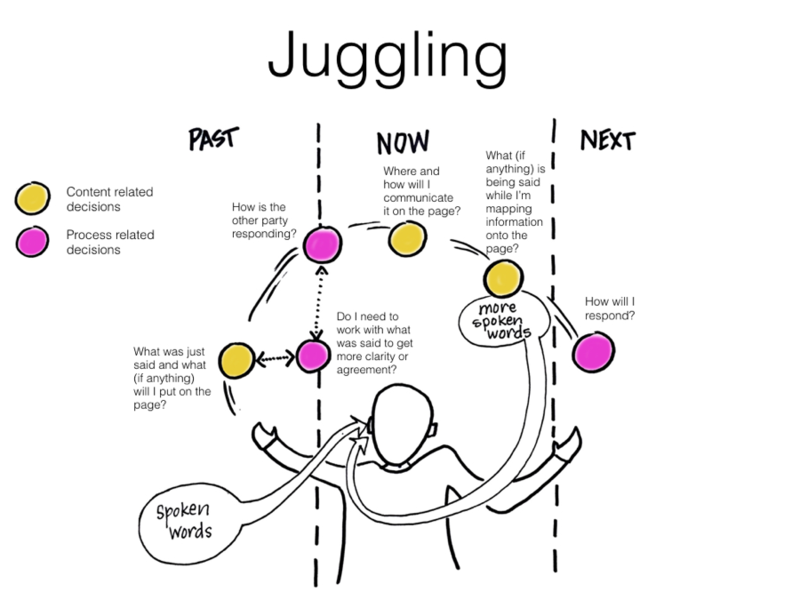 A visual mediator takes notes in a way that is public to the parties, which means the parties are watching you do this tremendous juggling act! A big part of becoming an effective Visual Mediator is developing your ability to make instantaneous decisions about what information to capture (and what not to capture) and knowing why you’re making those choices. While you are selecting information to display, the visual representation should be something that all parties agree is an accurate reflection of the conversation that is happening in the room. What types/layers of information am I hearing at this stage of the mediation? What would be the purpose of writing down this particular comment? Is this information past/present or future focused? Would this bit of information help create understanding, support the development of an agreement? Does this comment support the overall mediation goals? Will I work any further with this information I’m considering to include on the map? As was mentioned before, you want to capture the nuggets of the conversation, not everything that was said. The idea is to take down enough so that you don’t lose the meaning while making sure that what you capture is detailed enough that someone who wasn’t in the room could understand what was discussed. So, you want to be succinct, but not so much so that you lose context. Combining listening and drawing skills to make meaning of what’s being said in a room is a juggling act where you have to balance between paying attention to the conversation (across 3 moments of time), filtering out the most important parts, and synthesizing the information to then writing it in a place where parties can see and use the information. While it might seem like a big leap to leave your private notepad behind and map things on a whiteboard, flip chart or giant piece of paper, it’s important to remember that there’s no “right” set of content to capture. With practice, you’ll develop your ability to make in-the-moment decisions that enable you to show the information that is most useful and to facilitate greater understanding by giving the parties an organized way to retain and process their information. What else have you learned about multi-tasking in mediation that assists you in note-taking? If you haven’t yet used visual techniques in your mediation but think it might be something you want to incorporate into your practice, you can download a free copy of my Visual Mediation Agenda Template and Step-by-Step Mediator’s Guide here and give it a try in your next session.